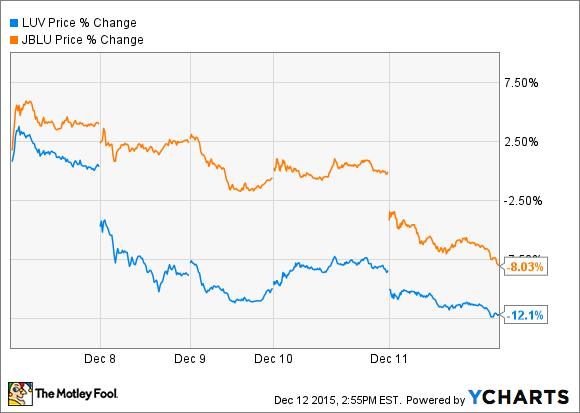 Buying Airlines on the Dip: Southwest or JetBlue? Shares of both discount carriers got knocked down last week -- but one is more likely to experience a strong rebound. Last Tuesday, shares of Southwest Airlines (NYSE:LUV) plunged 9% after the company reduced its Q4 unit revenue guidance. On Thursday, fellow discount carrier JetBlue Airways (NASDAQ:JBLU) dropped 8% after it also disappointed investors with its Q4 unit revenue forecast. Southwest Airlines vs. JetBlue Airways weekly stock chart, data by YCharts. After these pullbacks, Southwest Airlines ended last week 15% below its 52-week high, while JetBlue ended the week 14% below its own 52-week high. This presents a potentially intriguing buying opportunity for investors. But which stock has better prospects? In its Q3 earnings report, Southwest Airlines projected that its unit revenue would rise 1% year over year during the fourth quarter. That was better than what investors had been expecting. As a result, this guidance helped shares of Southwest rally from around $41 before the earnings report to a high above $50 last week. However, on Dec. 8, Southwest cut its guidance. It now expects unit revenue to decline 0%-1% this quarter. The carrier saw "unusual discounting" from its larger rivals during November, according to CEO Gary Kelly. Southwest Airlines will fall a bit short of its bullish Q4 guidance. As a result, Southwest Airlines stock has now given up nearly all of the gains it had achieved since reporting its Q3 earnings. Based on its Friday closing price of $43.42, it trades for about 12.3 times its projected 2015 earnings per share of $3.52. JetBlue doesn't provide quarterly unit revenue guidance. However, on the company's third-quarter earnings call, CFO Mark Powers projected that passenger unit revenue would decline 2% in October. He also estimated that unit revenue would be better in November and worse in December due to the timing of Thanksgiving and Christmas. JetBlue later confirmed that passenger unit revenue declined 2% in October. Last week, JetBlue reported that passenger unit revenue increased about 2% in November. However, the company also stated at that time that passenger unit revenue was likely to decline 2%-3% for the full quarter. While JetBlue's unit revenue trajectory this quarter is essentially playing out as Powers had projected on the Q3 earnings call, investors were apparently hoping for more. JetBlue stock ended last week at $23.43; its lowest point since early September. That's about 12.1 times JetBlue's projected 2015 EPS. While both stocks look relatively cheap now, JetBlue shares seem more attractive. First, it has not hedged any of its fuel costs for 2016 and beyond. Since oil prices have dramatically fallen in the past few months, JetBlue is now on pace to save hundreds of millions of dollars on fuel in 2016. JetBlue is on pace to save a lot of money on fuel next year. Image source: JetBlue Airways. By contrast, Southwest Airlines had over $1 billion in unrealized hedging losses for the 2016-2018 period as of the end of September. The recent drop in oil prices has probably aggravated those losses. As a result, it won't see as much fuel cost savings as JetBlue. Additionally, Southwest Airlines' unit revenue performance has been lifted dramatically in the second half of 2015 by a new credit card deal that increased its compensation. This factor will continue to benefit unit revenue in the first half of 2016. However, Southwest will lap the implementation of this new agreement in mid-2016. Meanwhile, JetBlue has its own new credit card deal that is going into effect in early 2016. This will accelerate its unit revenue growth next year. JetBlue will also benefit in 2016 from the expansion of its Mint premium service and the full-year impact of a new fare system implemented in mid-2015, under which the cheapest tickets do not include a free checked bag. For all these reasons, JetBlue's profit is likely to skyrocket next year, while Southwest Airlines will probably have to be content with more modest earnings growth. As a result, I expect JetBlue shares to soar to new highs in 2016, whereas Southwest Airlines may not have much upside beyond the all-time high it reached earlier this month.